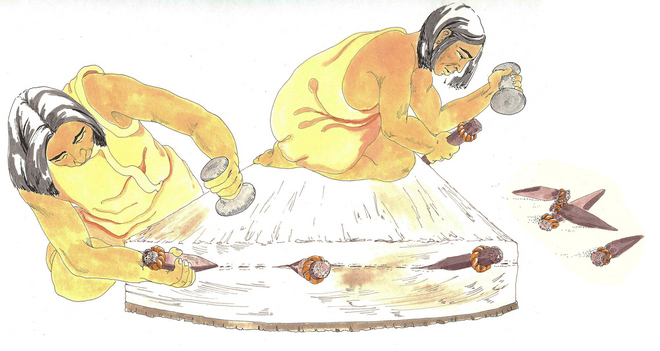 At our last potlatch, the first chief—my uncle—spoke about the family and things that are happening in our house. He talked about the marriage of his brother to a young woman from another village. He was happy that this man—another of my uncles—had taken this woman as his wife and brought her to live in our house. I'm pleased too, because she has become my best friend. Then he spoke about another one of his brothers. This man's wife had given birth to twins, something very unusual for my people. Families with twins are special and seem almost supernatural. Because of this, his family could not live with the other people in the village for four years. Instead, they went to live in a small house built especially for them a little distance away. The first chief reminded us that many moons have passed since his brother's family moved away. Now the twins are in their fourth year, so it is time for the family to return. This will happen in the spring, when we move to our summer village near the sea. 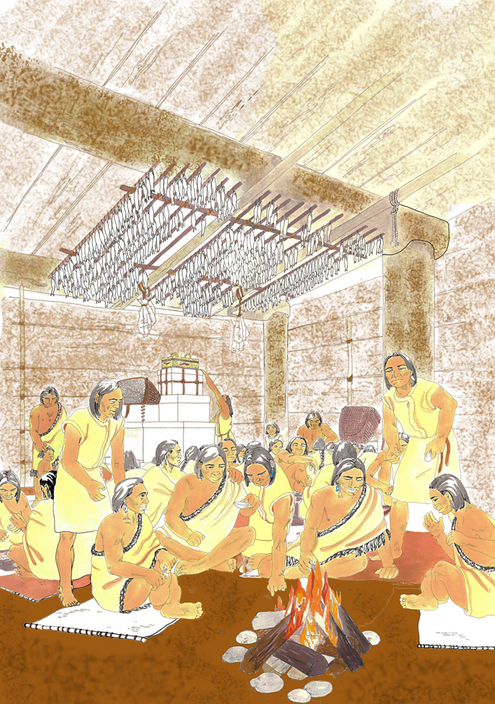 With all the extra people, the first chief said that his house is going to be too crowded. He had spent the day talking to his brothers—my father and my other uncles—who are the lower chiefs of the house. He asked their opinions and listened to them carefully. 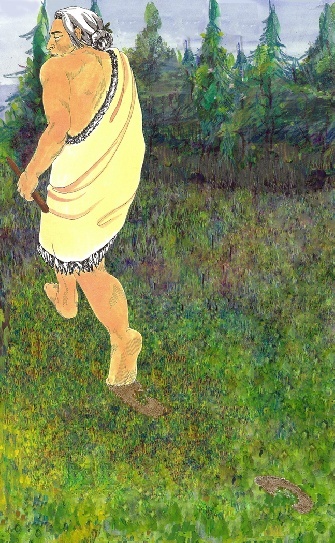 Then, as chief of the village, he decided what to do. He announced that we are going to build a new house. Some of the people in his house now will go to live there instead. I could hardly believe my ears! I looked around at the huge house posts that were the frame of the house. They were so big! I could not imagine how they had ever been put in place. I have never seen a new house being built, I can hardly wait to see how it is done. The chief waited for the excited chattering of the people to stop. Then he said that the family with twins would live in the new house. His younger brother and his new wife would live there too. Then he announced that my father would be first chief of the new house. This means I will live in the new house too! I jumped up and ran to my uncle's new wife. We hugged each other and danced around. We were excited and happy that we would both be living in the new house. It is a clear winter day, and today the chiefs are going to choose a spot for the new house. I watch as my father and my uncles survey the land around the village. The men look at everything, and then gather in a little group around the first chief to discuss their ideas. I think they are never going to stop talking. At last, they walk to a sheltered spot near the beach. I like this place at the end of the village. It is near a place where I often sit on a rock. I watch my father as he begins to mark the place where the house will stand. He takes 12 long paces to mark the width of the house. Then he walks 15 long paces in the other direction to mark the length. I know he has to measure carefully. He has to make sure the new house will not be as large as the first chief's house. The house of the first chief of the village is always the biggest. Now that they have decided on the size of the house, they have to find trees to use for house posts. 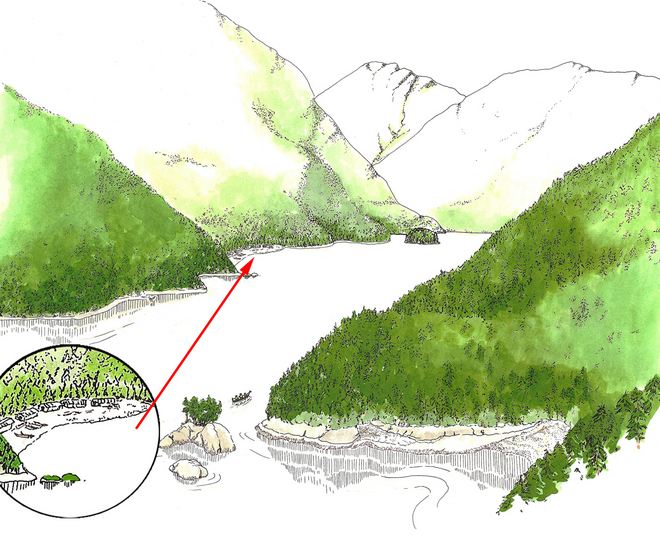 My father and his brother paddle down the inlet in their canoe until they find a place with some good, sturdy trees. They pull their canoe onto the beach and walk through the forest to choose and mark the trees they want. Later, other men will cut down the trees and float them to the village. These men live in the first chief's house, but are not chiefs. They are the common people who work for the first chief. 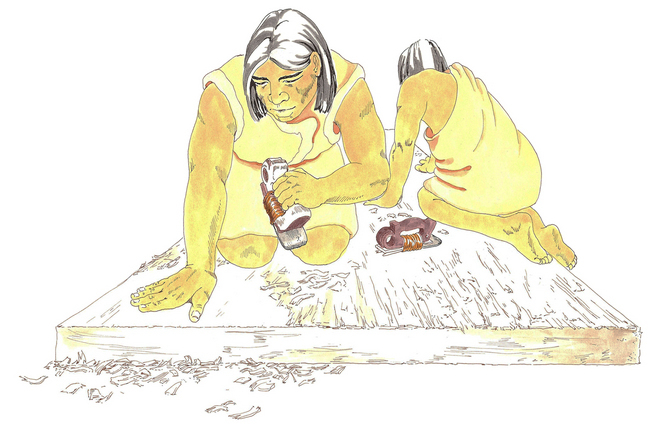 In return for their work, the first chief looks after them and their families. Some of the common people will live in the new house too. My father will be first chief, so when the house is built, the men who move into our house will work for him. In return, he will do what the other first chiefs in the village do and look after them and their families. I am very curious about the huge house posts. I want to see the trees that will be used. So one day, shortly after the men start to cut down the trees, I go with my friend to watch them. We push a small canoe into the water and hop in. We begin paddling down the inlet toward the spot where the men are working. The sound carries across the inlet, and we can hear the noise of the chisels and adzes tearing into the wood. Soon we spot the work party, lift our paddles and let the canoe drift near the shore so we can watch. I see that some trees have already been felled. Three men are kneeling on the ground beside them, hacking off branches. 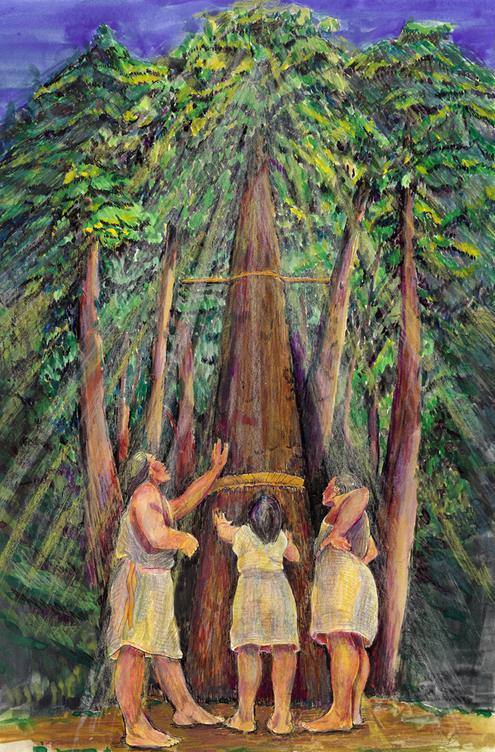 Farther away from the beach, three men are standing around a tree with a big, thick trunk. They are working at the base of the tree, chopping away pieces of it with their chisels and adzes. My father told me that it takes two or three days to cut down each tree. I can see that the men have been working on this tree for at least two days. It has a big, gaping cut at the bottom. Suddenly, the tree starts to sway. The men drop their tools and run. I hear a loud, creaking sound, and the tree comes crashing down. By the time the False Spawning Moon comes, the men have felled all the trees needed to build the frame of the new house. They have towed the logs behind their canoes to the village. Now these huge logs are lying at the bottom of a bank on the beach, ready to be moved to the site of our new house. I watched as the men built two ramps with some poles and old planks. Slowly they drag and lever the huge logs one at a time up the ramp. Then they roll them to the site of the new house. When all the logs have been moved to the new house site, I run up from the beach and meet my friend to watch a very important ceremony. It is time to mark the raising of the first post. 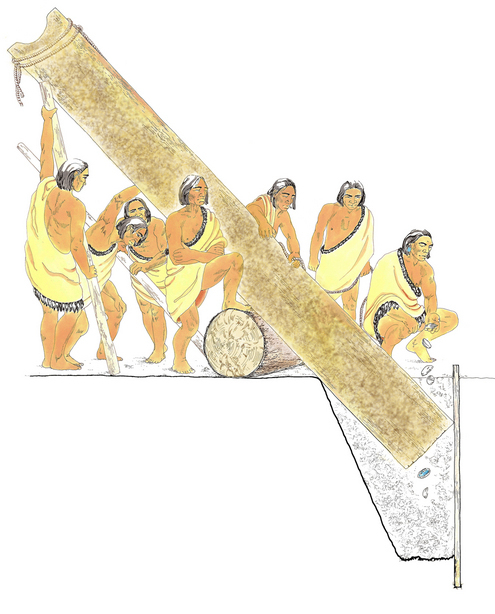 The men raise the first post until the top is halfway from the ground. Then all the work stops. Other villagers gather around to watch. The air is still, and everyone is quiet. My father drops some shells into the hole beside the bottom of the post. At the same time, his voice breaks the silence as he begins to sing. As he sings, the men strain with all their might to move the heavy post. As some men push one side of the post, others pull the opposite side. I can see the sweat dripping from their bodies. They work steadily to the rhythm of a chanter's cry, "Wuii wu!" Ever so slowly, the post begins to move until, at last, it stands in an upright position. The first post of my new house is in place! After many days, all seven house posts are finally in the ground, standing upright. 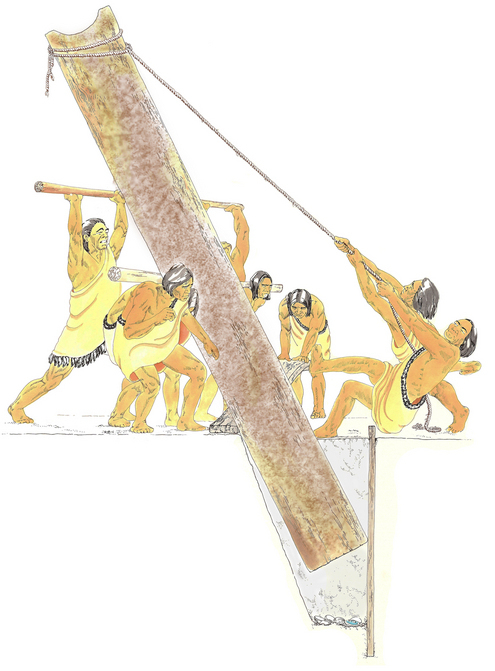 Next, the men have to hoist up the three long, heavy beams that will rest on top of the posts. I watch as they use other logs and posts to slowly hoist up the beams next to the posts. They raise one beam at a time. First they raise one side a little, and then they raise the other side. Many days pass as the men work to move each beam higher and higher. When a beam reaches the top of the pole, the men slowly roll it onto the tops of the two house posts. Then it drops into the notches carved in the posts to hold the beams in place. One day, soon after the men have finished their work, I enter the house frame. I walk around, looking at the posts and beams. I stop at the back of the house in the right-hand corner, facing the other end where the door will be. My family will live in the very corner where I am standing. My father's brother and his new wife will live at the far end of the house, next to the door. I close my eyes for a moment and try to imagine the finished house with a roof and walls. I picture it filled with people sitting around their fires. I know I will be happy here. Now, the Geese Moon is here, and it's time to move to our coastal village. 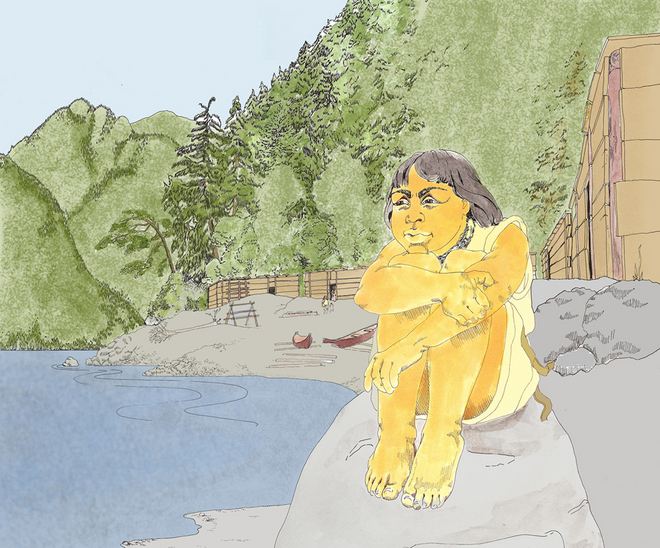 We arrive at the four empty house frames next to a small sheltered cove and unpack our canoes. The men remove the house boards we brought with us and fasten them onto our summer houses while we carry our belongings inside. It doesn't take us long to settle into our second home. 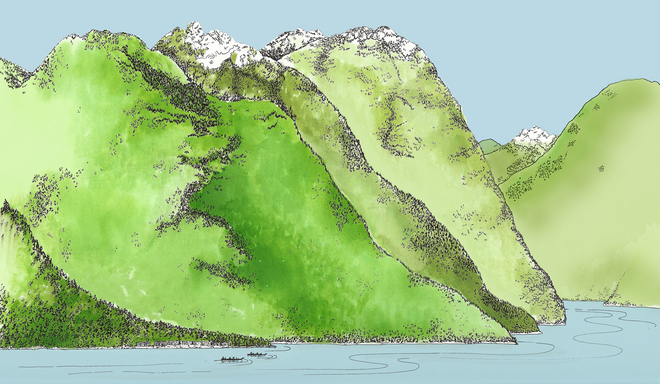 Once we are settled, it's time to choose a site for our new coastal house. We need two houses, one for the winter village up the inlet, which we just left, and one here at the summer village. 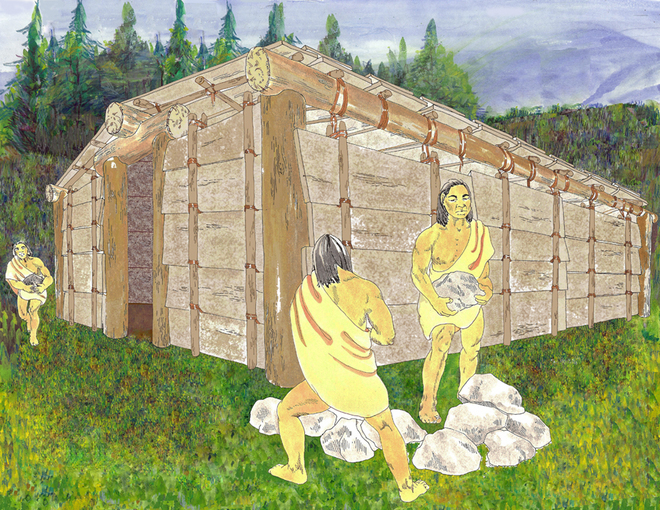 After choosing the site, the men have to build a new house frame. The first chief and my father send some men out to cut down trees for house posts. The posts of a house frame are big and heavy, so they are never moved. They are always left standing at each village site. 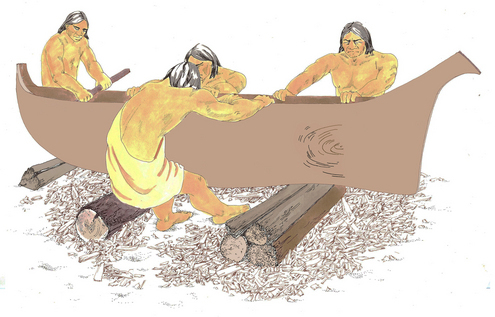 The first chief and my father also send some other men to start splitting wood to make house boards. We need only one set of house boards. The same set is used for both houses. My friend and I are curious about the house boards. We wonder how the wood for them is split off the trees. One day, my youngest uncle takes us to the edge of the forest where the men are working so we can see what they are doing for ourselves. My uncle leads us to a tall cedar tree. I look up at the huge trunk. A notch has been cut in the trunk far above my head. Much higher up the tree, I see a second notch. I notice a pole sticking out from each side of the upper notch. My uncle explains that the wind will move the pole back and forth. As it moves, the pole will split the piece of wood from the trunk. The weight of the pole will cause it to move downward and make the split bigger. 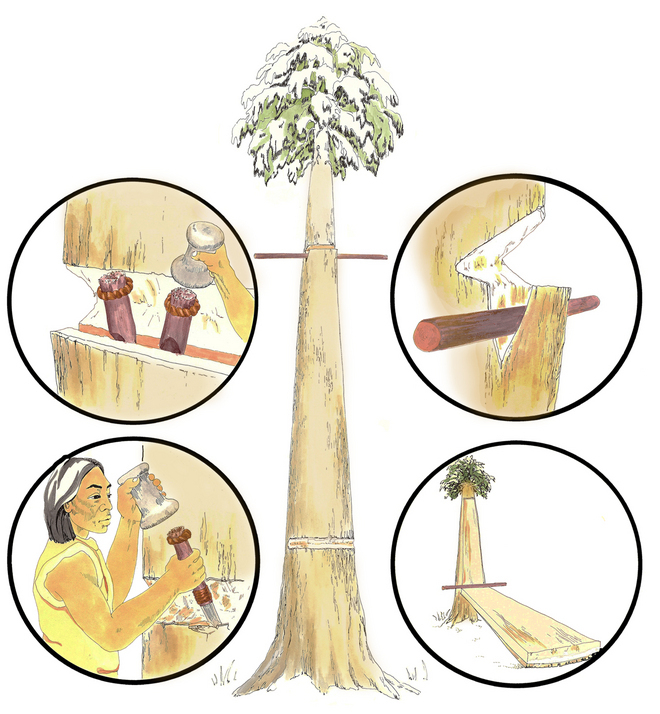 When the pole moves all the way down to the bottom notch, the slab of wood will fall off the tree. This slab will be used to make a house board. I can tell that this job will take a long time. The new house will not be ready for many more moons. One day, during the Wasp Moon, my uncle takes me and my friend to the forest again. This time it is to see how the house boards are made. The forest is very hot and dry at this time of year. We see two men kneeling on the ground near the trunk of a very large tree. A thick, long section of the tree has been split off. It is lying on the ground next to the men with the split side up. One of the men is carefully marking a line across one end of the wood. He places his fingers on the end of the piece at the top where the wood has split from the tree. He measures three fingers down from the split side. Then he marks a line in the wood with his chisel. My uncle explains that the three fingers measure the thickness of the house boards. After the wood is marked, the men bang in small wedges along the line they have made. Suddenly the wood starts to split along the wedges. Soon, the men have to use larger wedges, and the split grows bigger and bigger. 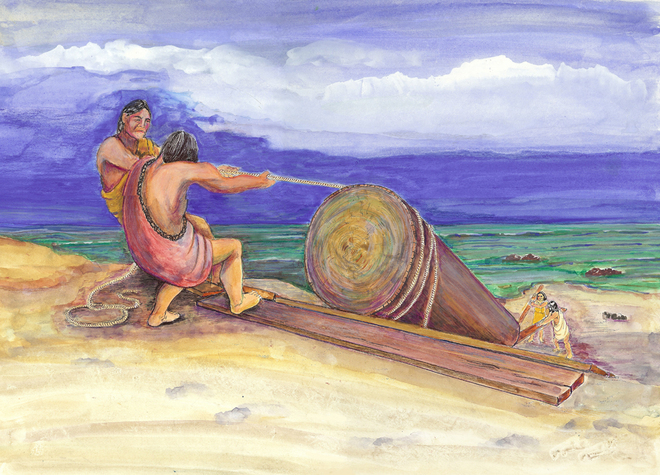 Then the men began to put wedges in both sides of the piece of wood along the spit. While one man puts in more wedges, the other picks up a short pole. He begins to pry along the edges with the pole. This loosens the slab of wood, or board, from the rest of the piece of wood even more. It is hard work to pry the board off the piece of wood. It is clear that it will take many hours before the men work their way along all the wood until the board splits off completely. So we leave the two men to their work and return to our village. On the way back, my uncle explains that other men are working in the forest too. With several teams at work, the house boards will soon begin to pile up. 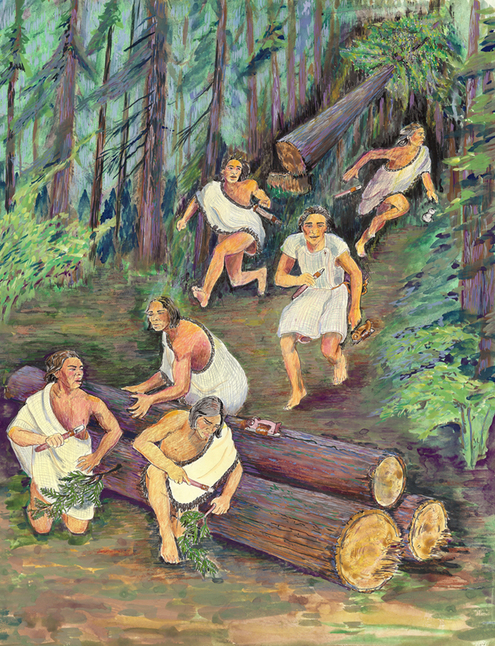 As the men split the boards from the pieces of wood, other men float them to the village. 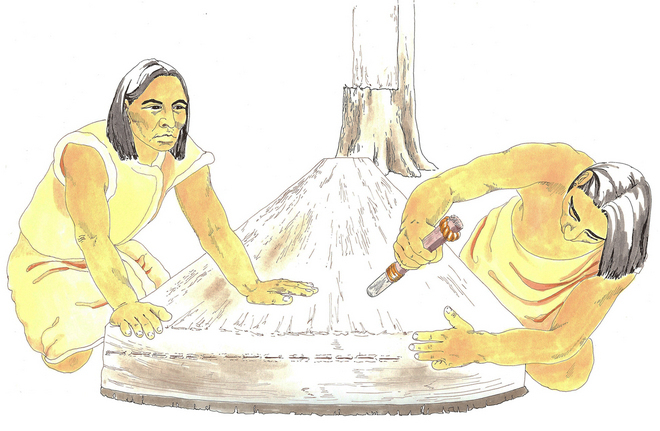 When the boards arrive, I watched as men use adzes to make the boards smooth and even. This is going to take a long time but the men are good at their work. With their skills and good weather, the house boards will be finished by fall. With the building of a new house, we are going to need more canoes. New freight canoes will carry the house boards and belongings from our new summer home to our winter site and back again. One warm day during the Salmonberries Moon, I walk to the end of the beach. I notice a group of men working on the slope above the beach near the village. I climb up the slope to see what they were doing. It is my youngest uncle and some helpers building a canoe. When the men cut down trees for the house posts earlier, they felled some extra trees. In the forest, they split off the upper part of the logs and adzed them roughly into the shape of canoes. Then, they towed them to the village. They saved one so my uncle could build his own canoe. He wants a sealing canoe so he can hunt seals and sea otters. 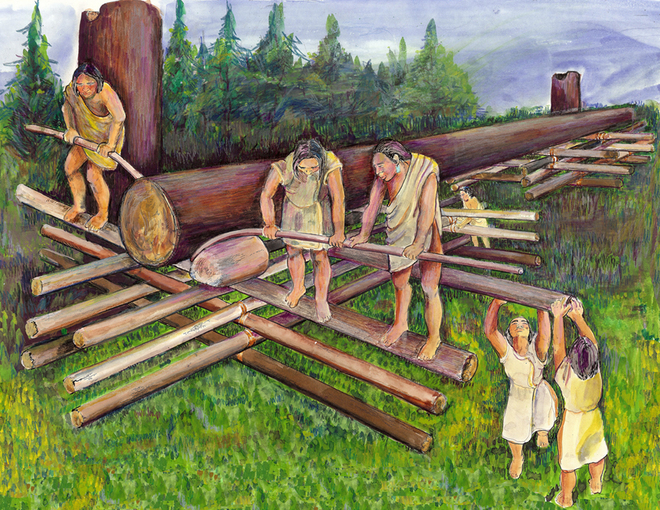 The canoe-shaped log is on a trestle so the men can work on it. They have hollowed it to make it into a canoe by chopping out the inside of the log. Next, they add the prow and stern. These parts are separate from the hull. The men lash them to the hull with cedar-bark cord. Now the men are pouring lots of water into the hull. I watch as they add hot rocks to the water to make it boil. 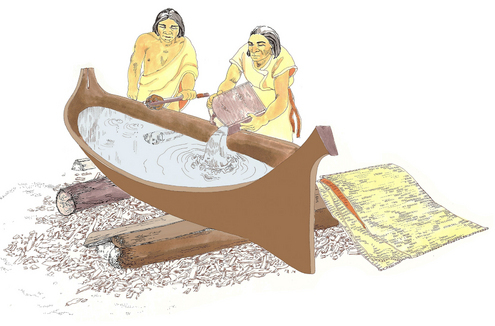 When the water finally starts to bubble, they cover the canoe with mats, and the water steams the interior. The canoe begins to get hot, and the wood becomes soft. 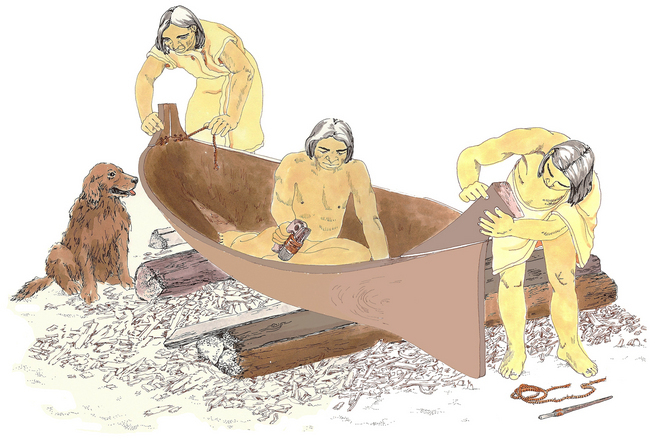 As soon as the whole canoe is hot, some of the men spread the sides apart. They have to be very strong to do this. Their bodies shine with sweat as they pull on the sides. When the sides are far enough apart, the other men force flat boards between them. The boards keep the sides apart and prevent them from going back to their original shape. When the men finish, they leave the canoe to cool. As my uncle and I return to the village, he explains to me what they have to do next. He describes how the canoe has to be smoothed down on the outside. The men will spend a long time rubbing it with coarse cedar mats so the surface will be perfectly smooth. After that, they will grease the outside well. 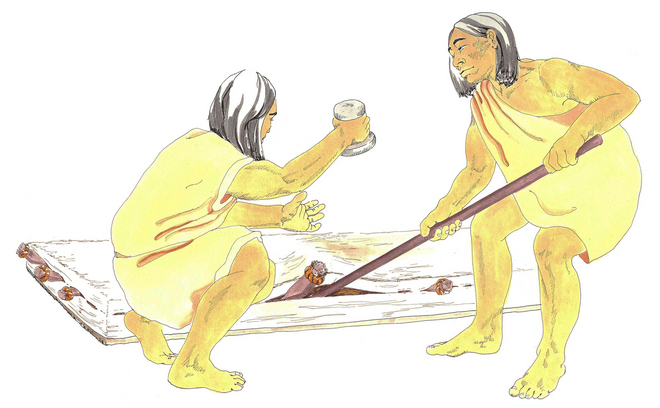 It was very important for a sealing canoe to be smooth and well-greased. A good canoe does not disturb the seals. It cuts through the water swiftly and silently. This allows the hunter to surprise the animals and harpoon them easily. Finally, it is the end of the Rough Sea Moon and time to return to our winter village. I am excited about leaving because when we arrive at the winter site, we will be able to move into our new house. When we arrive at the winter village, we return to the old house since the new house is not ready yet. Early one morning, a lot of noise in the village awakens me. I remember that this is the first day of the Elder (Sibling) Moon! Quickly, I leap from my sleeping platform and get ready to go outside. Important things are starting to happen in the village today, and I don't want to miss anything. I run along the beach to the place where the frame of the new house stands. I see a lot activity and several men busy at work. They have floated all our poles and house boards up the inlet from the summer village. Now the wooden parts are lying on the ground near the house frame. I climb onto my rock and sit down to watch what's happening. The men are using some rocks to pound some poles into the ground. They place the poles, in sets of two, all along the four sides of the house frame. Other men pick up long boards and place one end of the boards between one pair of poles and the other end between the next pair of poles. As soon as they finish putting a board in place, two more men place a second board beside it. One end of each board overlaps the end of the one next to it. Soon the entire first layer of house boards is in place. Next, the men prepare to add another layer of boards above those that are already in place. 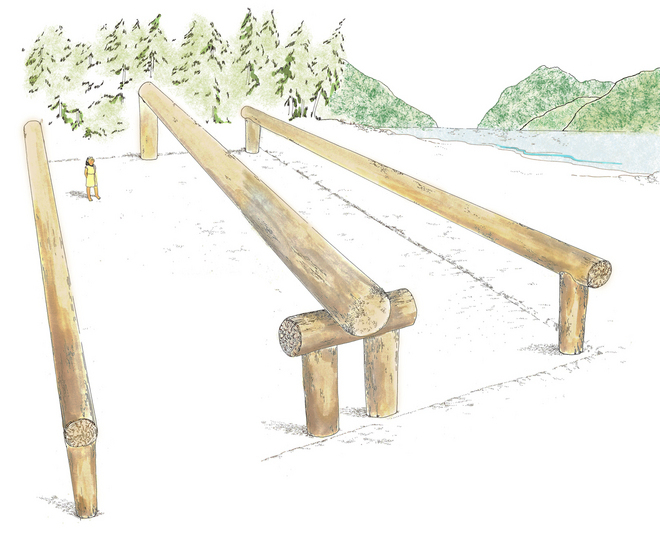 First, they tie cedar withes to the pair of poles. Each cedar withe hangs loosely between one pair of poles. The withes are used as slings to hold the next layer of boards in place. 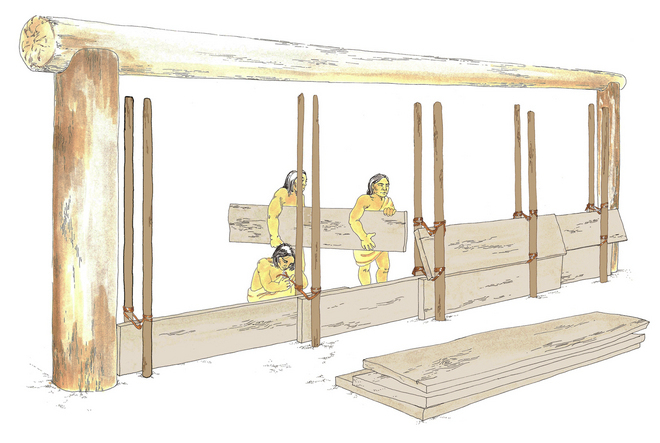 When the men put the boards between the pairs of poles, the cedar withes hold them in place. 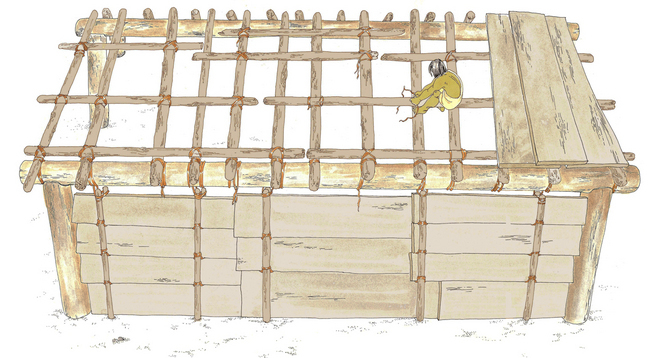 Because the withes hang loosely, the second layer of boards overlaps the first layer. Overlapping the boards makes sure that water from rain will run down the outside of the house and not get inside. The walls of the house grow higher, layer by layer. The top layer of the house boards is finally in place, and the men tie the tops of the poles to the top of the house frame. At last the walls of the house are finished! I have seen houses put together many times. Every time we move, we have to take our houses apart at one village and put them together again at the other village. This time, however, it's different. This is my new house. Once the walls are finished, the men start to work on the roof. They lay small poles from the ridge poles at the top of the frame to the big poles at each side and tie them in place. These small polls will be the rafters. When the men are finished, the poles remind me of a giant net on top of the house. Next they lay a layer of roof boards over the small poles from the ridge pole to the sides. They leave spaces between the boards. Then they place a second layer of boards over the spaces. The edges of these boards overlap the edges of the boards in the first layer. This stops the rain from getting inside the house. When the roof is finished, the men collect some large rocks and pile them outside the house. These rocks will be used in stomy weather. When it starts to get windy, someone will climb onto the roof and put the rocks on top of the roof boards. Finally, the house is finished! I sit on my rock and admire the house for a few moments. Then, I jump down and run to my old house. People are starting to move things, and I want to do my part. I help my family carry our boxes, baskets, and other belongings to the new house. The people who are going to live there with us are also moving their belongings. After everything is in place, the fires have to be built. I help my mother and the other women gather wood for the fires. We pick up driftwood that has been washed up on the shore and take it to the house. We put a portion of the wood into the shallow fire pits and put the rest aside to be used later. Now we need to light the fires. My father goes to our old house and lights a torch from the the first chief's fire and carefully carries it back to our house. I stand in the dark and watch. One by one the fires are lit, bringing light and warmth to the new house. Soon they are all blazing. I stand in my family's living place and slowly look around. In the light cast by the flames of the fires, I see each family in its own compartment. My family is in the corner of the right at the back of the house. The chief of each house always owns this corner. My father's three younger brothers own the three other corners. Each brother's corner depends on his rank. The families of the common people and slaves have compartments along the sides of the house. They do not own their compartments, and they do not live in any special place. I know it will take time to learn where each of these families lives. I am surprised at the large size of each compartment in the new house. 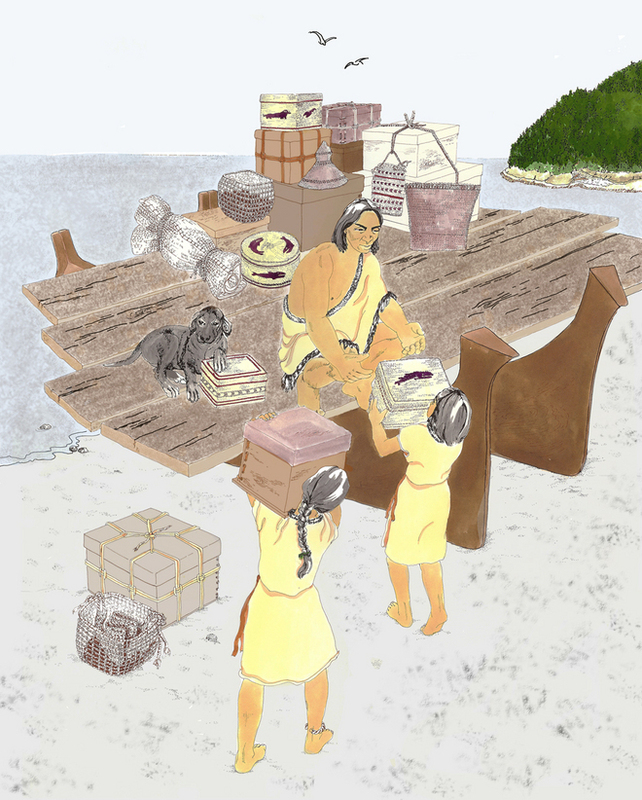 Every family has boxes, dishes, tools, and mats piled up in its compartment. Wooden storage chests are also stacked up, and they separate each compartment from the next. Near each fire, dried fish is hung from the roof with withes. The rest of the food is stored in boxes. Although the new house is filled with many people and all their belongings, there is still lots of extra space. That evening, when the fires are low, I sit down and stare into the flames. It is warm and comfortable. I am happy to be in the new house. The next morning, it seems like a new life has begun for me. As I sit on my rock next to our new house, I stare out over the water and think about the upcoming Shaman's Dance and the arrival of guests. I can hardly wait to entertain people in the new house for the first time.